Dental implants are commonly used to replace a lost or damaged tooth in adults. There are many reasons a patient might lose a tooth, including fracturing a tooth to the point it can’t be repaired, gum disease that results in losing a tooth, or cavities that result in losing a tooth. Often times, the damage to the tooth causes pain for the patient, and that’s the primary reason for removing the tooth. Think of your mouth and your teeth like a tightly packed bookshelf. If you take one book out of the row, all of the others start to shift around a bit. When a patient loses a tooth, it’s important to replace it in some way so that the other teeth don’t move around. Patients might also want to replace a tooth for cosmetic reasons, especially when it comes to visible front teeth that are damaged or lost. And, of course, there’s the functionality aspect of being able to chew as efficiently as possible. 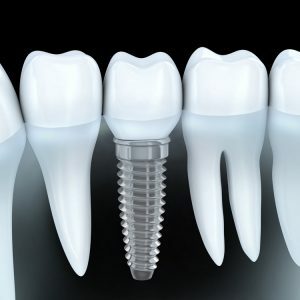 A dental implant involves attaching a metal post to your jaw bone and then attaching an artificial tooth or other prosthesis to those posts to create a permanent replacement for missing teeth. Dental implants are the most common way of replacing a tooth. It looks and feels like a natural tooth, and you can brush and floss it just like a natural tooth. Implant procedures are broken up into phases. It starts with placing the implant in the jaw bone and then allowing the jaw to heal before placing the tooth. It’s sort of like placing a fence post. Before you can actually attach the fence to the post, you have to let the concrete set up around it. That healing process can take up to three to six months for most patients. If the implant area is healed and feels solid enough, we can place a tooth at three months. If it’s not as stable as I want it to be, we’ll wait longer to place the tooth. One of the common questions asked about dental implants is whether or not they are painful. From our experience, most patients have little to no pain following implant placement. The majority of patients are able to manage their pain with over the counter pain medication when necessary. It all depends on the extent of the procedure though. Some are more simple than others. If a patient is in pain following the procedure, we can prescribe a stronger pain medication for a short period of time. As with any dental procedure, the total out-of-pocket cost will vary depending on your insurance plan. Most insurances cover at least a portion of the implant surgery, as well as the abutment and crown that make up the new tooth. If paying cash for a single tooth implant, the total cost to the patient would be about $3,800 for the full implant process. Additional implants or having dentures attached to an implant increases the cost. The final cost varies a bit from patient to patient depending on their specific case. Payment is due in full at the time of service, though our office does accept CareCredit healthcare financing. If approved, you can pay the cost over 12 months with no interest. Personally, I think implants are better than dentures. I’ve seen a lot of patients who really dislike their dentures, often because they never feel fully confident in them. You can, however, attach dentures to implants. The dentures snap on, and that really helps stabilize them and prevent them from coming out while you’re eating, laughing, or going about your normal day. It’s easier to chew with dentures attached to an implant as well. Still, anything you take out of your mouth is going to be less efficient and effective than something permanent like an implant. Implants are the standard for replacing teeth now. While we also have better options for repairing damaged teeth, there are many patients who lose multiple teeth as adults for one reason or another. Using an implant bridge on top and bottom is going to be as close as possible to their natural teeth, which is why I believe implants are the better option.